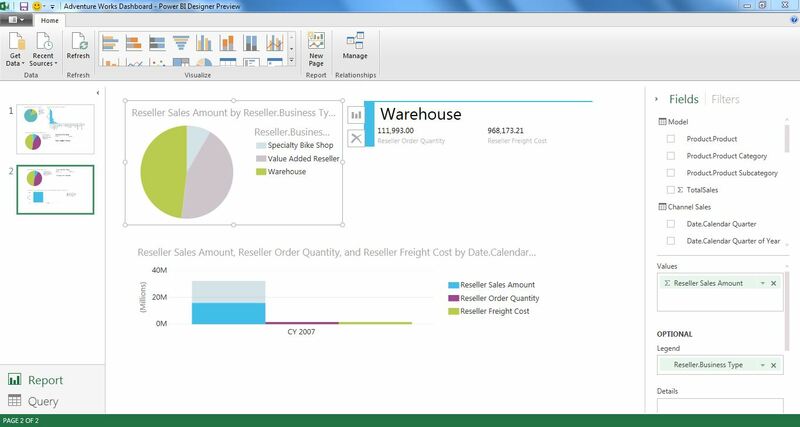 I am able to connect the Power BI Designer Preview to SSAS Multidimensional, which is a big plus for someone like me who have worked with SSAS multidimensional for a few years! 🙂 I just tested it and it has worked. Of course, it can also connect to SSAS tabular. 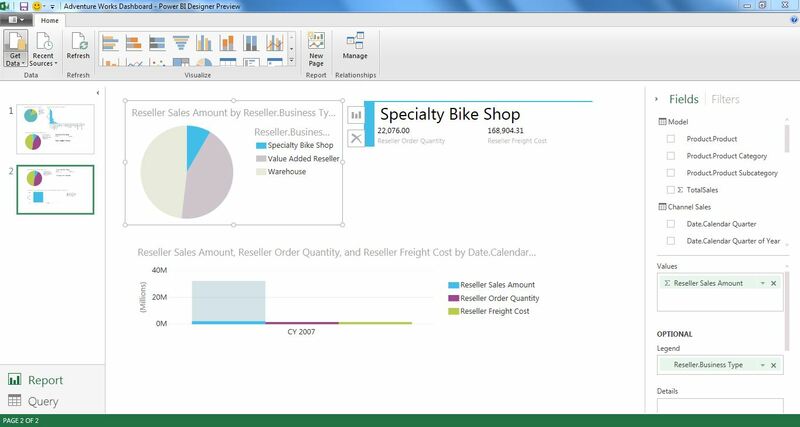 What I like about Power BI Preview is that you can add many pages to a dashboard, it is a stand alone application (not dependent on SharePoint or Excel), and that it is more interactive. I still need to find out how to host this in a shared environment (upload into SharePoint?) and how to manage security (is it done through cube?). Also yet to find out how to add an URL link on the graph, edit the graph title and the graph legends (we can do this in SSRS!). What’s worth noticing is that I still have no idea how to create a drilldown from one graph to another. The only way to display the details of your graph is by creating a table or card next to it, it seems. Screenshots below show a pie chart of the reseller sales amount by the reseller business types. There are 3 reseller business types I.e. warehouse, specialty bike shop and value added reseller. On the right side of the pie chart is a card showing the reseller order quantity and reseller freight cost of each business type. At the bottom side of the pie chart is a bar chart showing the reseller sales amount for each calendar year. Clicking on a pie slice will show its details on the card and bar chart.